Surprise early leaders of Targa NZ was Aucklander Haydn Mackenzie in a Mitsubishi Evo 10. Event rookies Haydn Mackenzie and co-driver Matty Sayers (Mitsubishi Evo 10) showed their hand early on the opening day of this year’s five-day Targa New Zealand tarmac motor rally on Tuesday. Defending – and four-time consecutive event winners – Glenn Inkster and co-driver Spencer Winn (Mitsubishi Evo 8) won the opening stage from just north of Invercargill to Wyndham. However fellow Aucklander Mackenzie and his Hamilton-based co-driver Matty Sayers were just 1.2 seconds back in second place. Mackenzie and Sayers then grabbed the overall event lead with a win over the two late model Porsche GT3 Rs of former event winners Martin Dippie and Tony Quinn in the second stage from East Gore to Pukerau via the roller-coaster Diamond Peak Road and Kaiwera, and held it into the final stage of the day, the marathon 42km run through the Catlins from just south if Owaka to just north of Niagara which started just after 5.00pm. Glenn Inkster and Spencer Winn managed to claw some of the time back they lost overshooting a corner in the second stage with a win in the 20.33km Stage 4 from Waikaka to Waikoikoi. However fellow event regulars Leigh Hooper and co-driver Michael Goudie (Subaru Impreza WRX) from Orewa north of Auckland won the fifth stage from Heriot via Moa Flat to Ettrick with Mackenzie and Sayers second, the Subaru Impreza WRX of Aucklanders Nic de Waal and co-driver Shane Reynolds third and Inkster and Winn fourth. This year’s is the 24th multi-day Targa event held in New Zealand, but only the second to be run on South Island roads, one of the reasons for the biggest entry in recent years; 65 in the main competition classes, 55 in the associated but untimed Targa Tour, and 22 in the new Time Trial section organised in association with the Vintage Car Club of New Zealand. Heading into this year’s Invercargill-Dunedin-Queenstown marathon, it looked like there would be another epic battle up front between five-time winner, circuit-owning entrepreneur Tony Quinn and co-driver Tony Anstiss and four-time winners Glenn Inkster and his co-driving boss, Spencer Winn. Hayden Mackenzie and his co-driving mate Matty Sayers have thrown a spanner into those particular works, however, as 35-year-old Toyota dealership principle Mackenzie himself admitted at the lunch time service at Milton it is – very – early days yet! Despite that, competing in this year’s ‘main Targa’ is something of a family affair for Mackenzie, whose parents Andrew and Julie are following their son’s progress in a special limited edition Toyota Celica GT4 Group A car in the concurrent but untimed Targa Tour. 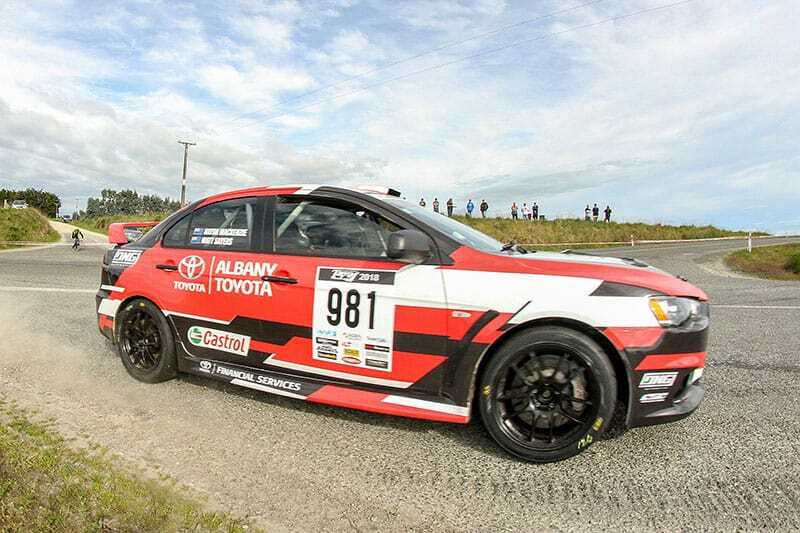 Though best known in the car trade for his time owning and running Auckland’s Albany Toyota (now in the hands of son Haydn) Andrew Mackenzie was born and raised in Balclutha so this year’s Targa event is something of a homecoming for him as well. Heading into the final stage last night, Mackenzie and Sayers led the AndrewSimms.co.nz Production 4WD class and the event overall. Second overall and leader of the AndrewSimms.co.nz Allcomers Extreme 2 and 4WD class (10) was Leigh Hopper and co-driver Michael Goudie. Third overall and second in the Allcomers Extreme Class 10 were Nic de Waal and co-driver Shane Reynolds, fourth and third in Class 10, the hard-pressed Glen Inkster and Spencer Winn. Fifth overall and leading the Global Security Production 2WD class was Dunedin driver Martin Dippie and new co-driver Greg Ball in Dippie’s Porsche GT3 RS while 16th overall but first in the HW.Richardson Classic class were Wellington pair Mark and his father Chris Kirk-Burnnand in their familiar E30 model BMW M3. This year’s Targa NZ heads to Dunedin today (Wed Oct 24) via six stages from Niagara in the south to George King Memorial Drive north-west of Mosgiel.